So it turns out that in the strange alternative world in which Lost Cowboy exists there is some kind of “Condiment Fairness Doctrine” – a tenet of which is that you must give equal time to ketchup and mustard. I have received much ribbing with a few recent posts about mustard. What can I say, I like mustard. I have nothing against ketchup, it is a fine condiment with French fries and the like, but I also found it to not be as versatile as I would like. Well, that was until I found the delightful Sir Kensington’s Gourmet Scooping Ketchup, which I sampled this summer at a barbeque party that I really did not want to attend. Sir Kensington’s Gourmet Scooping Ketchup made it all worth it. Again, I just say yummy. This the perfect culinary “find” for us – an old world product that is still available and can add a special touch to the most ordinary of meals. It is pricier than your supermarket ketchup – is about $9 for a jar – but you just need to roll this out for special occasions. Check out the Sir Kensington’s website – it is quite fun presenting a whole back-story for Sir Kensington himself. Was he real? I should think so. 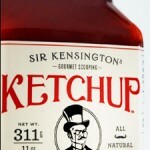 You can purchase the products – the classic or spicy versions of the ketchup – online, read the fun “facts” about Sir Kensington’s Gourmet Scooping Ketchup and find a gourmet food purveyor near you that stocks the product. Lost Cowboy is powered by	WordPress 5.0.4 and delivered to you in 0.778 seconds using 40 queries.